(CN) – Early humans in high altitudes may have had a high-fat diet, according to analysis of the stomach contents of a naturally preserved ice mummy found in the Alps. The study may provide clues about how people during the Copper Age prepared their food. Two German hikers discovered a human body on a mountain pass on the Austria-Italy border in 1991. They alerted authorities, believing the corpse to be a mountaineer. After the body was extracted, it was found to be the oldest naturally preserved ice mummy. Dubbed Ötzi, or the Iceman, he was believed to live during the late Neolithic age, more than 5,300 years ago. His body has been extensively studied, with findings about his stomach contents being published in the journal Current Biology this week. Ötzi ate meat from red deer and ibex – a type of wild goat – that was either fresh or dried, as well as a type of wheat, the study found. His stomach also showed traces of bracken, a kind of fern that is considered a precursor to modern wheat. When studies of Ötzi began, researchers were not able to locate the mummy’s stomach, which had shifted over the centuries. Though it was found during a 2009 CT scan, and they began work trying to analyze his diet. The scientists believe that Ötzi ate his last meal sometime between 30 minutes and two hours before he died. They were interested, though not surprised, by the high-fat content. 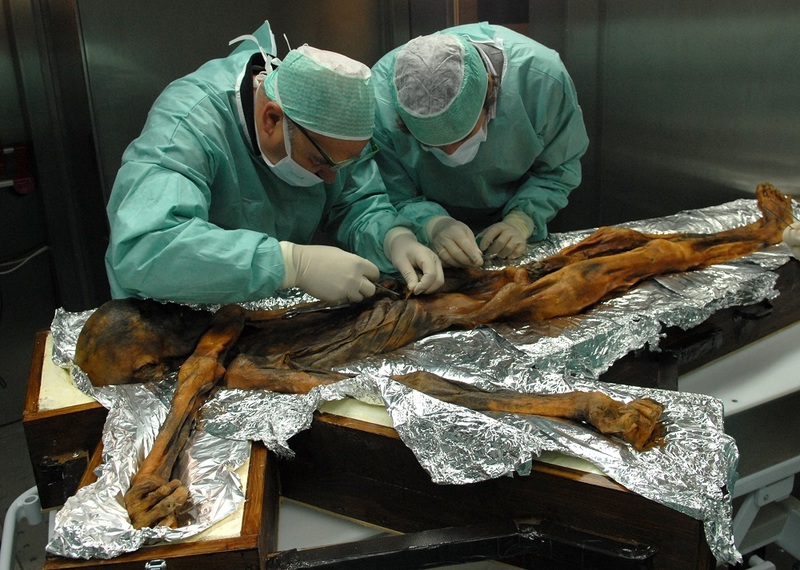 “Ötzi seems to have been aware of the fact that fats represent an excellent source of energy,” said microbiologist Frank Maixner. The analysis of the fat content in Ötzi’s stomach showed that the ibex meat he ate had been either air-dried or heated. Previous studies have determined that Ötzi likely had gut parasites, leading the scientists to speculate about the bracken found in his stomach: the stomach pain due to parasites may have led the Iceman to eat the bracken to remedy it. “It is also conceivable however that he had made use of the bracken leaves to wrap his food in and that traces of the plant inadvertently got into his food,” said Albert Zink of the Institute for Mummy Studies. The researchers used a broad-spectrum approach, including microscopes and modern molecular technology, to look at the ancient DNA, proteins and other chemical makeup of the stomach contents.